The wraiths from the Phantom Zone wreak havoc on the Squad. Amanda Waller realizes that her "weapon to destroy Superman" is about to destroy her and her Squad, and then be taken by the Superman Revenge Squad consisting of Cyborg Superman and the Eradicator. Cyborg Superman tells Zod that he needs to help them destroy Superman, but the ever unhinged Zod turns on him and the Eradicator, almost tearing them apart. Meanwhile the Squad desperatly battles the wraiths to no avail. An injured Rick Flagg tells Harley of his "suicide plan" to end this madness and close the gateway to the Black Vault. Amanda Waller overhears this and decides to take responsibility for her actions, as she tells them and the Squad that she will be the one to detonate the grenades to shut the Black Vault. She started this mess, she will finish it. The Squad goes on an all out assault against General Zod, Rick knocks Amanda Waller out, grabs the grenade belt and leaps in the vortex of the Black Vault, he sees General Zod's soldiers waiting on the other side, and detonates the grenades, closing the only doorway in and out of the Black Vault. The sight of the Black Vault closing breaks General Zod's spirits, and he falls to his knee's in defeat. The Eradicator and Cyborg Superman tell Zod that they know a way into the Phantom Zone, using the Phantom Zone Projector at the Fortress of Solitude, but in order to do so, they will need to kill Superman. The three of them fly off, and the Squad is left to pick up the pieces. Story - 4: Well this was an interesting issue. In all the time I have known of the character Zod, I've never seen or read him to ever give up, as he did at the conclusion of the battle this issue. I'm not entirely sure how I feel about that yet. This story has been building since issue #1 of this series, as the Black Vault is what Amanda Waller assembled this incarnation of the Squad top steal. As I have said in the past, I love when a writer plays the "long game" when it comes to setting up story lines. Which is the exact reason I feel that we haven't seen the end of General Zod in these pages. I cant imagine that Rob Williams would just end the matter right here. We never really got to see Zod be part of the Squad for long, so I really hope that Williams does bring him back. Now for my review of the last issue, I saw that I was criticized in the comments section, and was called a chauvinist and a prude, in regards to my view on how "loose" DC has made Harley. Well I'm sorry to say, I don't care much for making primary/popular characters to be promiscuous, be they male or female. But those are just my views. Regarding this issue, I would have liked the reaction that Harley has to Flagg's death a lot more, had the two of them had actually been more of an item throughout the series so far. It just felt a little bit slapped on. Rob Williams is a good writer, I'm sure he will be able to spin it into something good. I say this because I have a feeling that Rick Flagg isn't really dead, and like Zod, he may make a comeback further down the line. Lastly we are left with the burning question, who will lead the Squad, now that Rick Flagg is dead?... My moneys on Harley Quin. Why you ask?... It comes down to popularity. She is one of the most popular characters in the DCU, so I think they will capitalize on that fact. Art - 5: It was a shame that Tony Daniel didn't render this final chapter of this story. He's been the consecutive artist for three issues, so maybe the deadline was just too tight for him, however in saying that, Neil Edwards did a great job. His style was similar enough to Daniels that it would mix well, but he has some pizazz of his own. He has a great grasp on facial expressions, as well as his figure work. 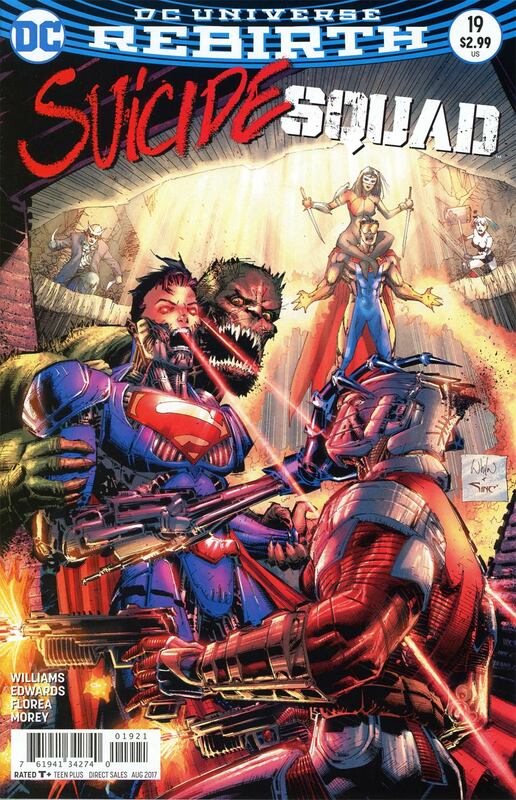 His Cyborg Superman was reminiscent of "Butch"Guice's work on the character during the Reign of the Supermen story line. As was the same with The Eradicator. I was hoping to see Superman, but he was unfortunately absent during this issue. Which is just as well, as during the events of this issue, he is stuck in the Black Vault, which causes him to go blind (check out the recent issues of Action comics for more on that). Neil Edwards did a great job of showing how savage Zod can be, and I liked the gaping open wound on his head from last issue when he ripped out his Nuero-Bomb. All in all a good issue art wise. Cover Art - 5: I like the standard cover by Daniel. 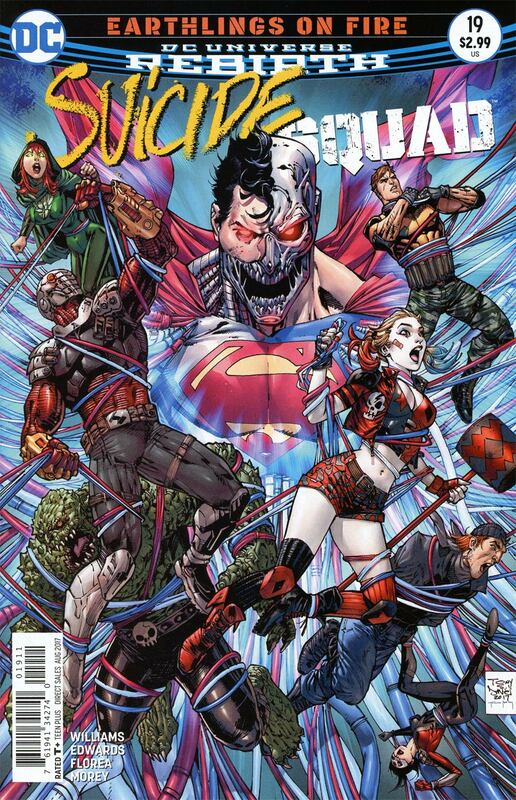 Cyborg Superman being in the center of all the chaos, he always did look good on a cover! Not a big fan of the variant. Its not Portacio's best work.